The deadly Sars virus has returned, according to the Singapore health ministry. A 27-year-old Singaporean student has tested positive for Sars, ministry officials said, becoming the first new case of the pneumonia-like respiratory disease in five months. The World Health Organization has said the new case does not represent a general threat to public health. The WHO's test for Sars demands X-ray proof of a pneumonia-like virus but the student has had three X-rays none of which has shown such changes in his lungs. But two blood tests for the virus have proved positive, and the authorities are taking no chances. The man, who has not been named, had been working in a microbiology laboratory in the National University of Singapore. The laboratory had been used for Sars research, but other workers there tested negative for the virus, and it is not know if this was the cause. "It appears to be a single isolated case," the Ministry of Health said in a statement. Singapore's acting Health Minister, Khaw Boon Wan, said he thought the man posed a "low public health risk" because he was isolated quickly. But, as a further precautionary measure, Singapore health authorities have quarantined 25 people who had been in contact with him. The BBC's Clive Myrie, who is in Singapore, says the authorities stress that this is an isolated case, that Sars is not a widespread public threat, that enough precautionary measures are being taken. But, he says the news that the killer virus is back will alarm many - not just here but across the globe. The WHO said the case was not typical of Sars. "It doesn't meet all our criteria," the WHO regional spokesman Peter Cordingley told Associated Press. "We are not challenging the Singapore Government's conclusions. If anybody knows about Sars, it's Singapore. "There are just some pieces missing. We are looking for more information," he said. "It appears to us that nobody else is infected so it doesn't look at this stage as if we're looking at human-to-human infection. "We'd like to know what the source is of this infection," Mr Cordingley said. 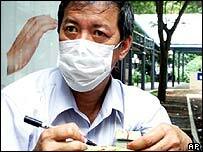 Singapore was declared Sars-free on 31 May by the WHO, but has maintained a high level of vigilance against a possible comeback of the virus. It originated in China late last year and killed more than 800 people before being contained in July. Singapore recorded 33 deaths from the disease, and another 328 were infected. In Hong Kong, which was the worst-hit country, after China, during the Sars global outbreak, the health authorities have been put on high alert. Shortly before Singapore discovered its suspected new case, the head of the World Health Organization had warned the disease could re-appear. "None of us can predict what will happen later this year," director general Lee Jong-wook told a regional conference of health specialists. "We have to prepare on the assumption that this will come back," he added. A WHO spokesman said the disease - which is believed to have jumped from animals to humans - could do so again. "We think it's quite likely lurking in the wild animal population in southern China," spokesman Peter Cordingley told Reuters news agency. What is your reaction to this latest Sars outbreak? Send us your comments using the postform below. My reaction to this new outbreak is very alarming. It seems that these new virus are increasing in scope and intensity, so there could be a threat to mankind as a whole. The sign is worrying. However, the situation in Singapore is very calm at the moment. Kids are playing on the field, commuters are taking the buses and MRT (Singapore's underground). I can say we are much more prepared this time. Hopefully SARS will not re-appear in other countries as well. This could be a good thing! If this person is carrying the reparatory virus, but not suffering from the symptoms which would normally be present in the lungs, he may be carrying the antibodies necessary to fight the virus, and pave the way for a vaccine. One would hope that that possibility is already being investigated. I have future in-laws that live in Singapore and I must admit that having the SARS virus about does make you think twice about travelling. I have not met my in-laws yet, as I my fiancée and myself were planning to see them Christmas. As I work in a hospital in a maternity block, even the slightest chance I may bring something back is worrying because of the babies directly in my work area. We seem to find cures for most things, but like AIDS it may take some time. I just hope we are able to cure it sooner rather than later! As everyone around the world should know by now, SARS is a very dangerous illness and a cure needs to be found to get rid of this disease. Not in the least worried when it is in Singapore because we have doctors and nurses who are capable of handling it very efficiently and professionally. The MOH also have the expertise to deal with it and they have everything in place. So every Singaporean just have to take of himself or herself. We should all be worried about SARS. After the first outbreak of the virus was contained so quickly earlier this year, people were insisting that all the concern was overdone. However, if this disease is seasonal, it could paralyse affected areas across Asia. Places like Singapore and Hong Kong, which depend on international travel and communications, will be most at risk. Let us not panic. The Singaporean Government in its wisdom will deal with this quickly and in the proper manner without the need for alarm. Let the knowledge overcome the fear. While it is good to be very vigilant about any possible SARS outbreak, the way the current situation was handled was far too over-reactive. To declare it as a SARS case, the WHO guidelines must be complied with which is not in this case. And sadly, this has caused lots of bloodletting in the stock market on the last 30 minutes of trading today. There is generally a sense of calm in Singapore, the experience we received form the first out break will stand us in good stead this time. Already schools, hospitals and industries are on heightened alert. Precautionary measures are in place. It is becoming obvious that we are going to face SARS once again. The important thing is to learn from the past and not allow the virus to spread. Today one person, tomorrow one thousand? Therefore authorities should take serious precautions. Don't ignore SARS, it can be catastrophic. If anybody knows about SARS, it's Singapore! I have to agree with the WHO´s official, since Singapore kept precautionary measures in place until the morning I have left Singapore on August 27th, that is only the controls on an extensive public scale. Still the more specific test on personal more exposed to the immediate infection risk means that Singapore authorities do exert a high level of risk control and take no chances. To me Singapore was a safe place and will always be health wise. SARS will re-emerge in some changed form sooner or later. The most important aspect is the depleting immunity among the urban populace. It is also worth noting that playing with pathogens (viruses and other micro organisms) in labs and naturally by misuse of drugs is only creating better chances for mutations. Let us hope and pray that the terrorist organizations fail to exploit it. I am afraid of this disease, I can not believe how medical science has not discovered yet a cure. I hope it could be soon. I am really sorry for that guy being affected with SARS. Really hope that he will get well soon. I was planning to travel to Singapore this weekend, but now I just cancelled my flight ticket. Now I have to stay in UK for the next two weeks, doing nothing. "Authorities stress that this is an isolated case"